Mating occurs during hibernation. Sperm stored until ovulation in March, when fertilization occurs. Single young born after gestation of around 2 months. Each female recognizes her own young and nurses it until it is about two months old. The young grow quickly and can fly at three weeks old. Adult survivorship is about 80 percent. Some individuals live for 15 to 20 years. The Virginia big-eared bat exists in isolated colonies in Virginia, West Virginia, North Carolina, Tennessee and Kentucky. The Grandfather Mountain colony uses habitats in Avery, Caldwell and Watauga counties in North Carolina, and Carter and Johnson counties in Tennessee. The Virginia big-eared bat is a very rare resident of the northwestern mountains of North Carolina. Most populations of this species, often called the Western big-eared bat, live in the western United States. Biologists know of only one colony of these bats in North Carolina. They stay in the Grandfather Mountain and Beech Mountain areas most of the time, and a small cave near the Blue Ridge Parkway provides them with a winter sanctuary. Conservationists built a gate at the cave entrance to keep visitors from disturbing the bats during their hibernation. The Virginia big-eared bat is one of North Carolina’s largest bats. Its 1-inch long, ribbed ears and glandular lumps on its nose distinguish it from all but one other bat, the Rafinesque’s big-eared bat. 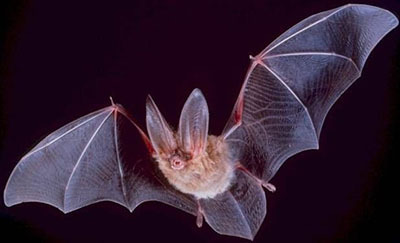 The Virginia big-eared bat has brown fur on its back and tan underparts, while the Rafinesque’s big-eared bat has gray fur on its back and white underparts. The Virginia big-eared bat also has shorter hair on its toes. The Virginia big-eared bat is an agile flier. It is capable of hovering, as well as swift flight. It flies with deep wing beats, interspersed with brief glides. When the bat is flying slowly, its ears stand erect. During fast flights, the bat’s ears are parallel with the ground and hardly noticeable. Biologists found Virginia big-eared bats in North Carolina in 1981. Several specimens collected from the population years ago were incorrectly identified as Rafinesque’s big-eared bat. Once the mistake became apparent, a check of known caves in the area turned up a small population of Virginia big-eared bats. The U.S. Fish and Wildlife Service listed the Virginia big-eared bat as endangered in 1979 because the bat occurred in just a few caves in the Appalachian mountains and populations in these caves were declining. Conservation actions taken since then have apparently stabilized these populations. North Carolina’s population of Virginia big-eared bats lives in northern hardwood forests. Much of the population hibernates in a small cave on Grandfather Mountain. 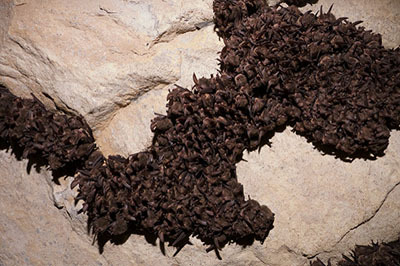 The number of bats using this cave increases during late summer and fall. Mating presumably occurs here. Many of the bats depart during February and March. The females move to a maternity colony near Beech Mountain, where they give birth in June. Few people see this bat in its natural habitat because it is rare in North Carolina and sleeps (roosts) and hibernates in caves and mines. These bats can also roost in old barns, houses or outbuildings, where people in northwestern North Carolina may encounter them in spring or summer. Disturbance to hibernating Virginia big-eared bats may cause them to lose stores of fat needed to survive the winter. Disturbance to maternity colony sites can kill young bats. Virginia big-eared bats may fly when disturbed, but close passes by flying bats are not attacks. This bat is a docile animal, though its gremlin-like looks frighten some people. While bats in buildings can cause a mess with guano (bat droppings), they rarely harm the people living there. Contrary to popular belief, most bats are not rabid. However, any wild mammal has the potential to carry rabies, and individuals that are easily caught may be ill or injured. People should not handle any wild mammals, including bats. If you find a bat in a building, don’t touch it and don’t panic. Open windows or doors so the bat can fly outside. If it is in an outbuilding, leave it alone. The N.C. Wildlife Resources Commission is gathering data on the Virginia bigeared bat, which faces extinction because of habitat destruction and disturbances at cave roost sites in Avery, Watauga, Yancey counties in North Carolina and Carter and Johnson counties, Tennessee. If you see a Virginia big-eared bat, please report it to: photos@ncwildlife.org. Send photos, if available. Written by Allen Boynton, Katherine Caldwell, Phil Spivey, and Joey Weber, NCWRC; updated 2017. Barbour, R. W., and W. H. Davis. 1969. Bats of America. University Press of Kentucky, Lexington, Kentucky, USA. Tuttle, M. D. 1988. America’s Neighborhood Bats. University of Texas Press, Austin, Texas, USA. Webster, W. D., J. F. Parnell, and W. Biggs, Jr. 2004. Mammals of the Carolinas Virginia and Maryland. University of North Carolina Press, Chapel Hill, North Carolina, USA.